Monday, January 1st calls for a fresh start and a new year full of being productive. I like to think over the years, through blogging and being a student I’ve learnt the tricks of the trade of getting the job done. I always work better having woken up at a planned time. Get up and get dressed. It’s tempting to work from bed or stay in your PJs all day but this causes me to stick in that lazy mindset. Get up and get dressed as if you’re going out to the office – even if you’re not! List everything you need to do that day, week or month. Prioritise what needs to be done first and how long each task to make your goals clear and achievable! 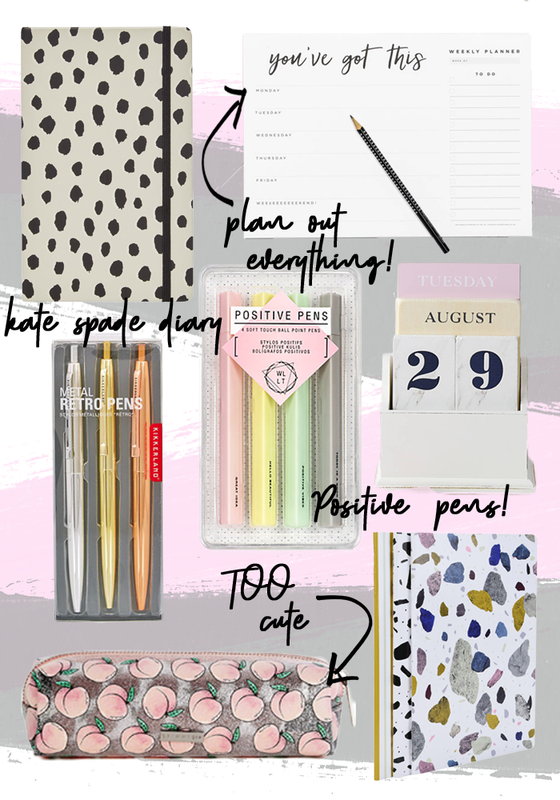 If you read my Favourite desk accessories post you’ll know having a good desk, full of stationary, quotes and everything else is crucial to success! One thing that I live by for productivity is my desk planner. I’ve been using one religiously for 3 years now. Sitting down on a Sunday evening and planning my week ahead is my favourite part of the week. Writing down everything I have going on, especially when I’m at uni and have different lectures, training sessions and other things going on really helps clear my mind and visualise what needs to be done. This is the planner I have for the new year! A diary is always a good idea to have in your bag too. I tend to use my iPhone diary to add in any meetings or plans I make while out and about so I don’t forget anything and so that everything’s all in one place! And of course, cute stationary always helps with the motivation to get some work done. These positive pens are possibly the cutest thing I’ve seen all year. What are your tips for top productivity? Can bloggers lead a private life?